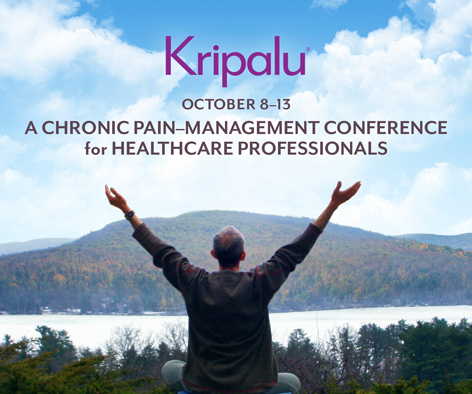 For physicians, physician assistants, nurses, nurse practitioners, clinicians, acupuncturists, psychologists, yoga and mindfulness teachers, caregivers, and other healthcare professionals who treat patients living with chronic pain. Join distinguished neuroscientists, physicians, physiotherapists, yoga researchers, expert authors, and yoga and mindfulness teachers in a dynamic, multifaceted educational experience curated for professionals interested in an integrative approach to the treatment of chronic pain from a collaborative and multidisciplinary perspective. Chronic pain is an enormous crisis—debilitating more Americans than cancer, diabetes, and heart disease combined—and is now seen as a disease in its own right. Our nation is affected by opioid addiction and restriction, and the increasing evidence of the failure of synthetic drugs. Throughout the week, Kripalu also offers experiential solutions to the challenging burnout that impacts providers today in workshops on self-care, building resilience, food as medicine, and Ayurvedic rejuvenation. Come be a part of the conversation at this critical point in healthcare, and bring home tools and techniques to empower you and your patients or clients dealing with chronic pain. View the detailed workshop schedule. Do you know a physician, nurse, clinician, psychologist, caregiver, or other professional concerned about this critical point in healthcare? Download and pass along this flyer. Want to post on social media? Download this graphic for use on Facebook, Twitter, and Instagram. Berkshire Health Systems designates this live educational activity for 22.25 AMA PRA Category 1 credits(s)™. Physicians should only claim credit commensurate with the extent of their participation in the activity. Berkshire Health Systems is accredited by the Massachusetts Medical Society to provide continuing medical education for physicians. This activity has been planned and implemented in accordance with the Essential Areas and Policies of the Massachusetts Medical Society for Continuing Education through the Joint Providership of Berkshire Health Systems and Kripalu Center for Yoga & Health. Disclosure In accordance with the ACCME Standards of Commercial Support™ disclosure will be made before the program regarding the existence of any relationships that exist between the faculty and the manufacturers of any commercial products. Lorimer Moseley, DSc, PhD, is a clinical and research physiotherapist investigating pain in humans. Fadel Zeidan, PhD, assistant professor of neurobiology and associate director of neuroscience research at Wake Forest School of Medicine, works with mindfulness meditation–based pain relief. Neil Pearson, PT, MSc, BA-BPHE, C-IAYT, E-RYT 500, is a physical therapist, an adjunct professor at the University of British Columbia, and a faculty member for international yoga therapy programs. Sat Bir S. Khalsa, PhD, is assistant professor of medicine at Harvard Medical School at Brigham and Women’s Hospital, and the Research Director for the Kripalu Center for Yoga & Health. Alex Sabo, MD, a Kripalu-trained yoga teacher, is chair and program director of the department of psychiatry and behavioral sciences at Berkshire Medical Center. Lonnie Zeltzer, MD, is an expert in the field of pediatric pain. Jill Satterfield is founder of Vajra Yoga + Meditation, a synthesis of meditation, mindfulness, yoga, contemplative psychology, and compassion-in-action practices. Judy Foreman, a senior fellow at the Schuster Institute for Investigative Journalism at Brandeis University, is the author of A Nation in Pain and The Global Pain Crisis. Michael (Mick) Krasner, MD, professor of clinical medicine at the University of Rochester, practices primary care internal medicine and has been teaching mindfulness-based interventions to patients, medical students, and health professionals for 16 years. Marlysa Sullivan, MPT, C-IAYT, is an assistant professor in integrative health sciences, researcher, physical therapist, and yoga therapist specializing in chronic pain, neurological, and orthopedic conditions. Maureen Strafford, MD, is associate professor of public health and community medicine, anesthesiology, and pediatrics at Tufts University School of Medicine. Lisa Bergly Pearson (Swami Swarupananda), C-IAYT, E-RYT 500, guides teachers and professionals to explore the important interrelationships of suffering, unconditional love, and self-compassion. Lee Albert, NMT, is a national presenter and a popular neuromuscular therapist and yoga instructor at Kripalu. Dedicated to helping people help themselves, Lee created, practices, and teaches Integrated Positional Therapy—protocols to reduce and often eliminate chronic pain. Erin Casperson is the Dean of the Kripalu School of Ayurveda, an Ayurvedic Health Practitioner, and a 500-hour Kripalu Yoga teacher.